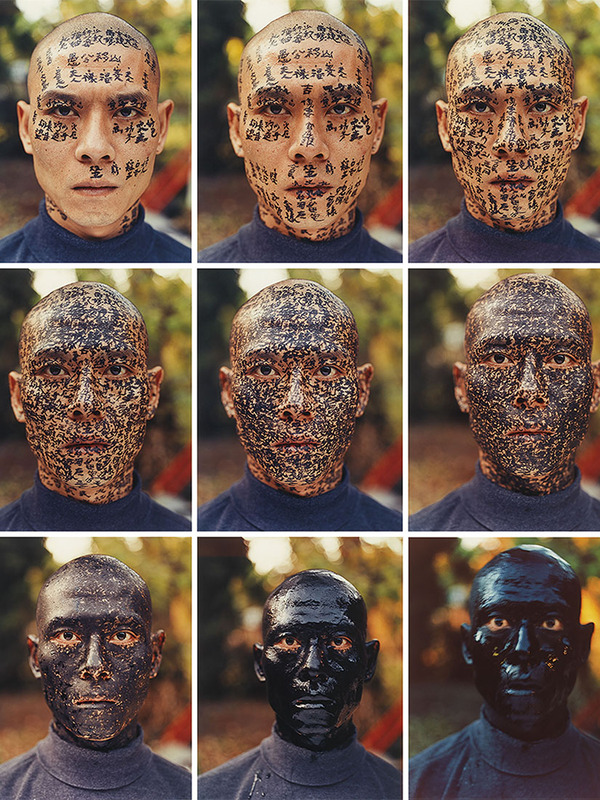 Why is Zhang Huan important? Zhang Huang is one of the greatest and perhaps most popular controversial artists in contemporary China. He first started making a name for himself in the mid-1990s thanks to his performances, many of which have frequently been regarded as too punishing. Case in point, some of his more popular performances featured him naked and covered in insects. Other performances saw him coated in seeds before being pelted with pieces of bread by the participating audience, wearing a suit made from raw meat or his whole face painted black. 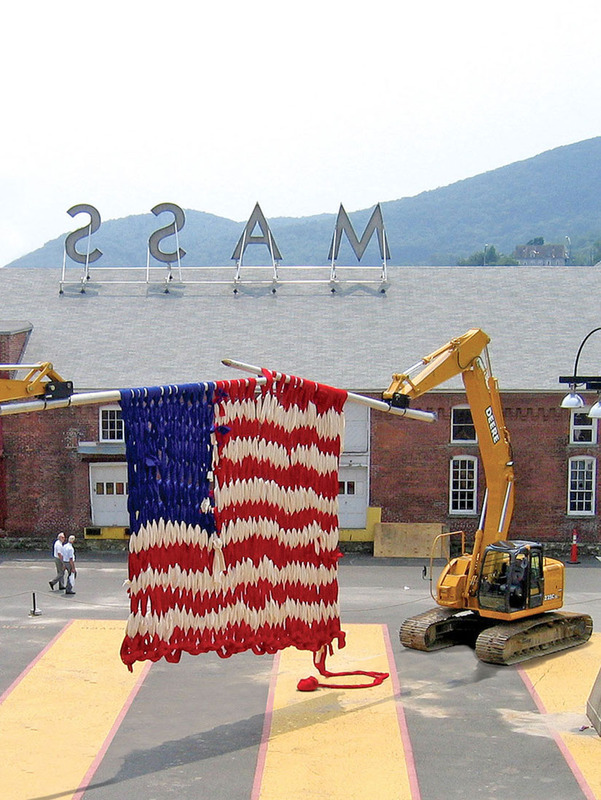 The majority of his installations are inspired by both political and spiritual messages. As a result, his work has often brought him into loggerheads with the Chinese authorities, but it is his willingness to push boundaries with his artistic expression that has made him so successful. Back in the 1990s, Zhang was living in the eastern suburbs of Beijing along with other performance artists that were like him, trying to build a reputation for themselves. As more experimental artists started settling in the area, the group decided to name their community the Beijing East Village1 and fashioned it after New York’s East Village2. Although artists were encouraged to create solo works, the village placed an emphasis on collective action, which allowed a lot of the members to collaborate and work together on projects. 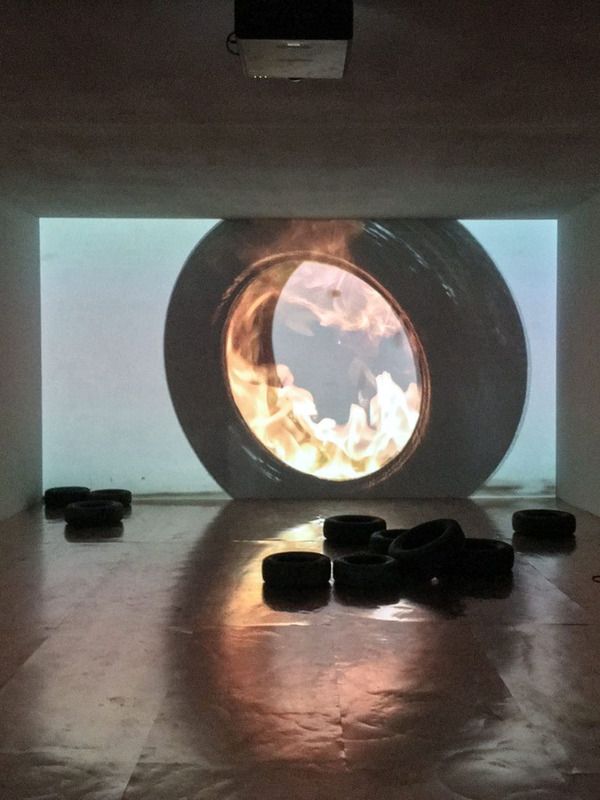 It was at the Beijing East Village that some of Zhang’s most iconic performances and installations, such as 25mm Threading Steel, 12 Square Meters, 65 Kilograms, and so on took place. Sadly, the Beijing East Village was disbanded in 1994 after a police raid led to involuntary evictions. In protest, community members led by Zhang chose to collaborate on one final project which resulted in the performance piece titled To Add One Meter To An Anonymous Mountain. In this piece, artists of the Beijing East Village climbed to the top of the nearby Miaofeng Mountain in the Mentougou District, which was the site of the piece. At the site, the participants shed their clothes before arranging themselves by ascending weight into four rows. The artists then lay on top of each other to create a human pyramid. At the end of it all, the participating artists had added one extra meter to the Miaofeng Mountain. This performance piece heralded by Zhang was deeply significant culturally. According to Zhang, it was inspired by an ancient Chinese proverb that comments on the importance of humility even in the face of challenges. With To Add One Meter To An Anonymous Mountain, Zhang was communicating to audiences that there will always be more challenges awaiting individuals after they conquer or overcome one set of challenges. As such, the point was to encourage people to accept change and embrace opportunities as they present themselves. Ten years later, Zuoxiao Zuzhou, one of the fellow performers, went back to Miaofeng Mountain. 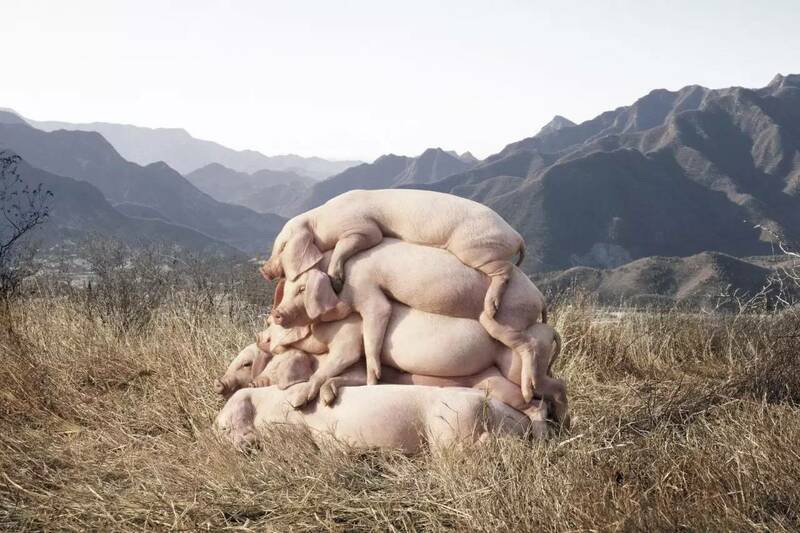 This time drunken pigs were stacked on top of each other instead of humans. 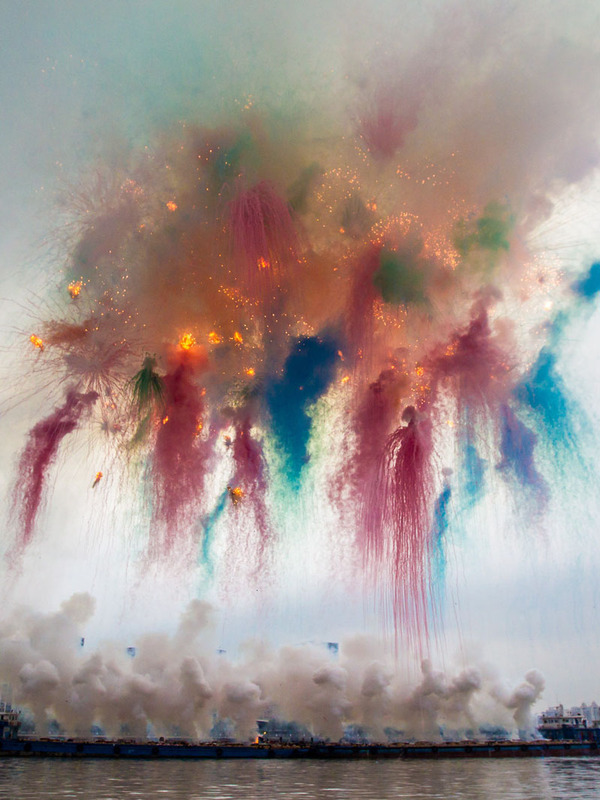 Zuoxiao Zuzhou – I Love Contemporary Art Too, 2007, Photograph, 16 1/2 x 24 in. Zhang Huan’s performance was shown amongst important works such as Ai Weiwei’s Dropping a Han Dynasty Urn3 in the exhibition ‘Art and China after 1989: Theater of the World‘4 at the Solomon R. Guggenheim Museum in New York in 2017-2018. It was the largest exhibition of contemporary art from China that has ever been mounted in North America. After causing significant public outrage, Dogs Which Cannot Touch Each Other5 by Sun Yuan and Peng Yu had been removed from that exhibition. Posted on December 7, 2018	in the category Performance and tagged 1995, activism, Art in Beijing, Art in China and by Chinese artists, performance art, pigs, Zhang Huan. 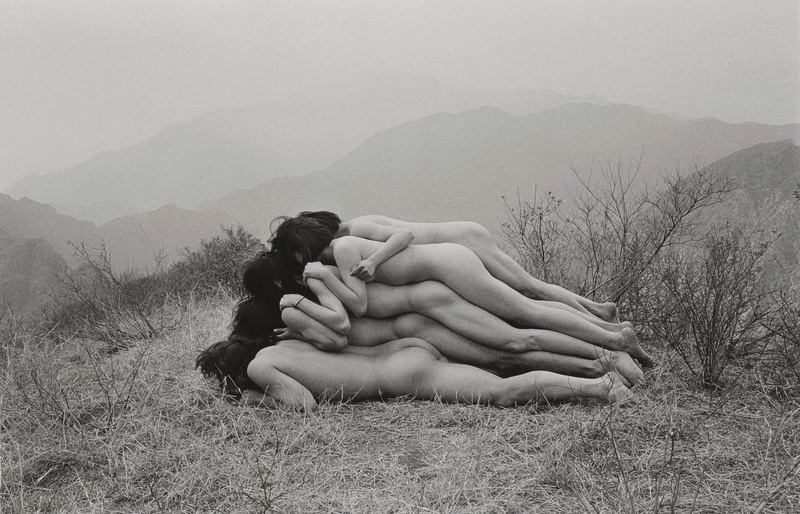 5 Responses to "Iconic performance: Naked people stacked on top of each other"